Located on the south-eastern coast of the Ionian Sea, Syracuse is the capital of the Italian island of Sicily, to the south of the mainland. A region increasingly popular with tourists, Sicily is a unique collection of beautiful coasts, rough natural lands and charismatic historical towns, and Syracuse is a perfect example of this. A city steeped in history, the origins of Syracuse can be traced all the way back to Ancient Greek settlers. What’s more remarkable, however, is just how much of this city’s history has survived, creating an attractive modern tourist destination with one foot firmly in its rich past. If you’re thinking of visiting Syracuse through one of our luxury villas in Sicily, then consider putting these activities at the top of your to-do list! If there’s one thing you have to do when visiting an Italian city, it’s visiting the Piazza. Otherwise known as the ‘town square’, these places are always a hive of local activity that is perfect for all occasions, whether you’re looking to shop, eat, or just sit down and soak in the local atmosphere. The Piazza Duomo in Syracuse is no different. However, much like the city itself, it is the historical touch that makes it particularly unique. The Piazza Duomo, unlike many open, square Piazzas across the country, is built in a narrow, baroque-style, where paved streets intertwine with each other. This allows you to take a delightful journey through the city’s magnificent, almost peach-coloured stone buildings. Built on top of the ancient Greek acropolis that once stood there, you can still see the odd remnants of ancient civilisations along its path, something that is most apparent at the Piazza’s central location, the Duomo, or cathedral. Built on top of the old Greek temple to Athena, a few of the old structure’s columns remain visible, while a statue of the Virgin Mary sits where a golden structure of the Greek goddess would have once stood. For many, the main attraction of Syracuse is its incredible archaeological ruins, and it’s hard to argue that the Parco Archeologico della Neapolis isn’t the best attraction in this vibrant city. Located on the outskirts of Syracuse, this vast archaeological location is seen as the best on the island and shows the region’s history in fantastic detail. The vast archaeological park contains a plethora of ancient monuments for you to explore, including the famous Teatro Greco. Carved out of the stone from the hillside it is built into, the impressive, classic amphitheatre used to house around 16,000 people and was the location of many famous classical performances. 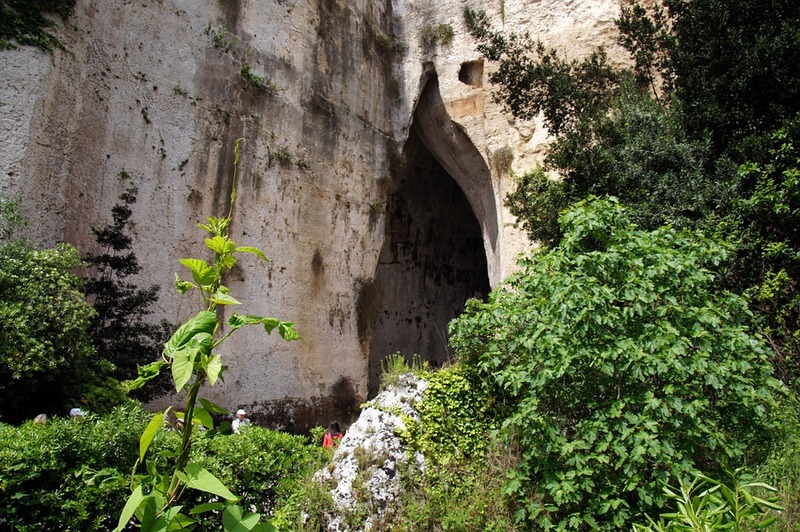 Another must-see monument in this park is the Orecchio di Dionisio, or Ear of Dionysius. Named by Michelangelo da Caravaggio – not to be confused with the famous sculptor Michelangelo – for its unique shape, this disused cave has remarkable acoustic properties, where it is said your voice will echo up to 16 times! No luxury holiday would be complete without a spot of shopping along an authentic Italian high street. 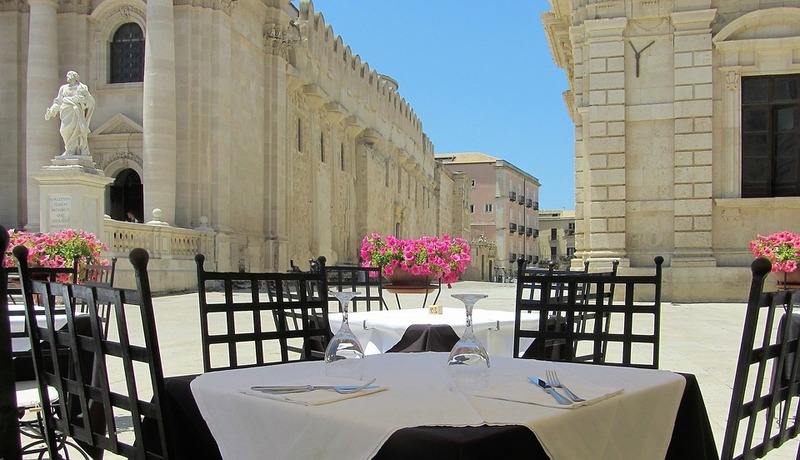 The Via Roma is one of the connected island of Ortigia’s main roads – heading south from the eye-catching Fountain of Diana, the street will take you past the Council Theatre and out to the stunning blue coast. Along the way, you will find a selection of authentic Sicilian shops and restaurants that are perfect for picking up luxury gifts or holiday keepsakes. One of the shops that you must visit while in the area is the Atelier Hélène Moreau. This famous store is run by a French artist who hand-paints silk and decorations for her shop, allowing you to pick up a truly unique piece of home or personal wear. She also takes commissions inspired by the Mediterranean, allowing you to own an individual piece of fashion hand-crafted by a master of the work. Another great place to pop into is the Trimarchi di Villa Marchese, an artisan food store showcasing some of the finest local foods, perfect for creating an authentic lunch or dinner to be enjoyed in your villa! Hopefully, this list has shown you the incredible time you can have in this famous Sicilian city. Famous for its incredible history, this cultural location also has a sense of modern luxury with boutique shops and beautiful modern landmarks, making it the perfect luxury destination in Sicily. If you’re thinking of visiting Sicily soon, check out why you must experience Christmas in Sicily.